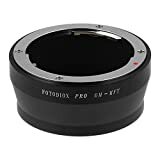 Fotodiox ‘Pro’ Series adapters are made with high standard precision to ensure the perfect fit for your camera and lens and to endure professional use. There is No “play” between lens and Camera for a secure fit due to the leaf springs which emulate the camera body. The unique styling maintains/enhances professional appearance. It allows Olympus 35mm OM Lenses to fit on a Micro-4/3 (MFT) system camera body. Although the lens will fit physically, automatic diaphragm, auto-focusing, or any other functions will not operate correctly while using this adapter. In this case “stop-down mode” will need to be used when metering since the lens does not have the ability to have its aperture controlled by the camera body. You can shoot with manual mode or aperture priority mode. Infinity focusing is allowed.